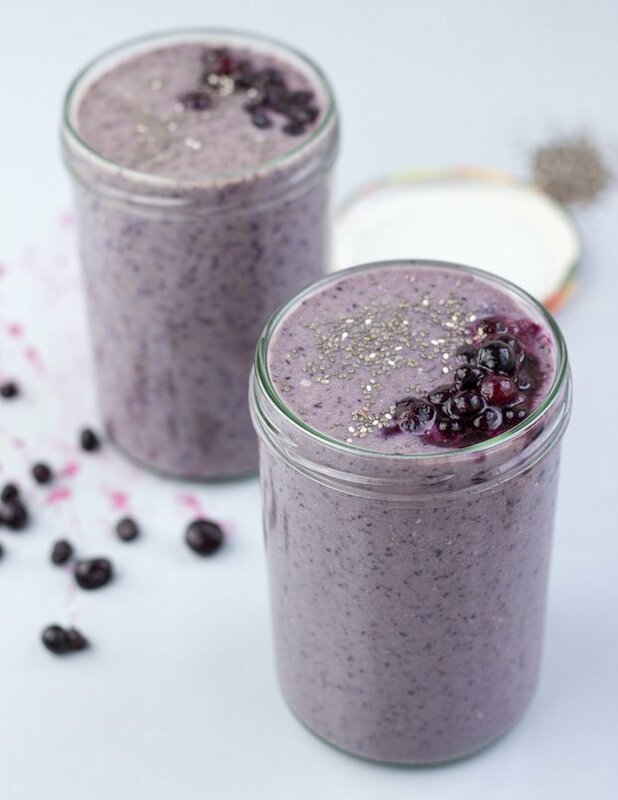 Blueberry Banana Protein Smoothie | 23g protein per serving! I’m gonna let you in on a little secret. We’re entering a competition! Yep, a smoothie competition at the end of the month. Because that’s how we roll. And sometimes blend. Anyhoo, that means we’ve been practicing. A lot. Some fruity combinations worked, some…not so well. 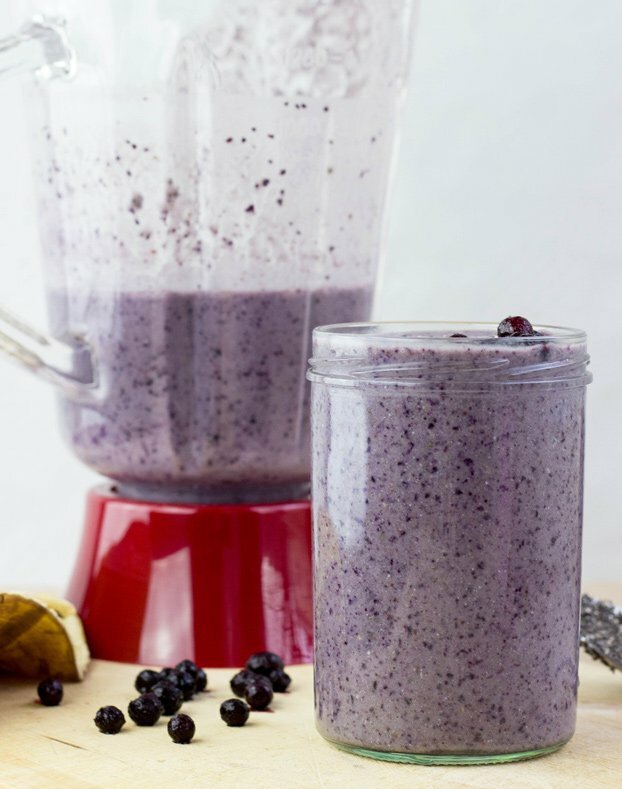 But this blueberry banana protein smoothie is one of our winners, and we thought it would be rude not to share it. Especially as Howie made so many nice pictures. And it tastes like cheesecake. Smoothies are a great way to get some healthy eating into your diets. Let’s take these blueberries as an example: Eat them three times per week and you’re very likely to improve your heart health significantly (1)! 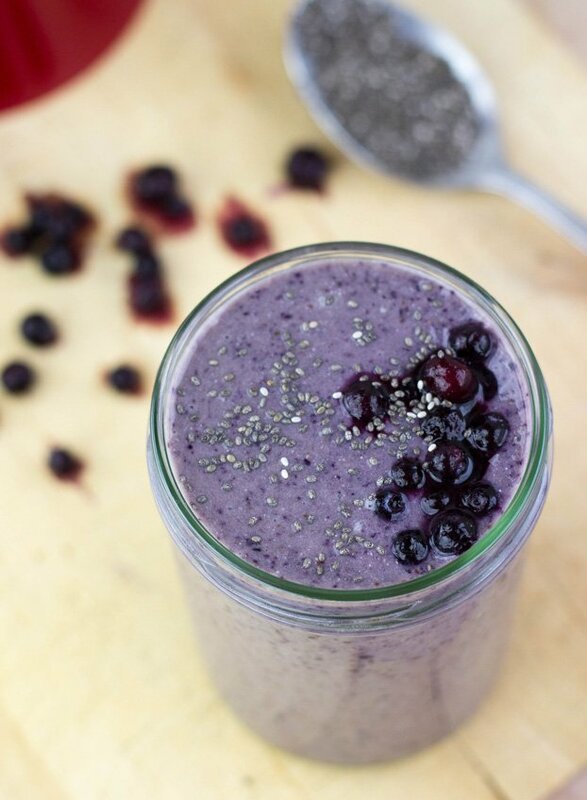 This blueberry banana smoothie is also an absolute protein beast. 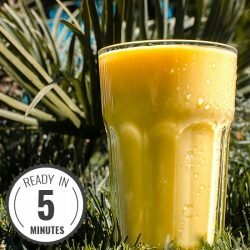 If you’re after a good workout recovery drink, or just looking to get more protein in your diet in general, then this is the smoothie for you. One serving (without added powder) already boasts well over 20g of the stuff – and with added powder (depending on the variety) will take you closer to the 45g mark. Those are the kind of numbers that would make Arnie blush. Choose some fruits. These can be anything you want, fresh or frozen, doesn’t matter. Your favourites, or a classic combo like mango and pineapple are a great place to start. We’ve gone for blueberry and banana in this example. 2 cups is about right. Put them in the blender. We prefer water or a variety of milk, there are so many to choose from. Soy milk, cow’s milk, rice milk and almond or another nut milk are all great in a smoothie. Coconut milk/water goes really nicely with pineapple, amongst others. Experiment, it’s hard to go wrong! 1 cup should do it. Put it in the blender. After fruit, this will make up the main part of your smoothie. Yogurt (dairy or otherwise) is a very popular choice here, although we tend to use cottage cheese (like in this recipe) for that low fat, extra protein hit. Silken tofu is also really nice and creamy, though we’re unsure how healthy it is. Whatever you choose, ½ – 1 cup is about right. Make your choice and put it in the blender. Now’s the time for adding that special something. Chia seeds are an all-round powerhouse, with so much to recommend them. We add two tablespoons to pretty much every smoothie we make – they don’t really taste of anything so they don’t change the smoothie flavour, but the health benefits are hard to ignore. We also add protein powder if it’s a post-workout smoothie, and this is an easy way to add a new flavour to the smoothie, chocolate or vanilla for example. Always taste test, and adjust as you like. If your fruits were a little too tangy or sharp then you might need something to take the edge off – maple syrup, honey, cinnamon or even more banana all do the job. See here to find out how to use bananas as a natural sweetener. In this example we add a little lemon zest for the kick. Put it in the blender. 5 – The Art of Blending. If you don’t have a blender, this might be the time to order one. They don’t need to be expensive, though they can be (this one is cheap and does it’s job). Once it’s arrived, follow the instructions above. Then push the button and let the machine do everything for you. It can mix quicker than you can. Just don’t forget to put the lid on. You don’t want that. Add the topping – some seeds, protein powder, flavourings or a sweetener are good choices. Blueberry Banana Protein Smoothie. A superior blueberry and banana smoothie with a huge protein kick! Try it, love it. And thank us later. 1 serving vanilla protein powder for that extra protein hit! Add all the ingredients to a blender, and grate in the lemon zest. Blend. Done! IF YOU LIKED THIS RECIPE: well, this isn’t our only awesome smoothie! 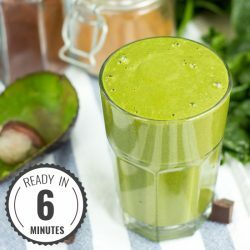 Some of our very first recipes were smoothies - like this easy spinach and banana smoothie (that doesn’t taste of spinach!). This yummy fitness mega smoothie is a firm favourite too! Our nutritional information uses 1 cup water as the liquid and 1 cup cottage cheese as the body. The color is so pretty! I don’t do smoothies hardly ever but if/when I do, I always want strawberries and blueberries, they are so good and sweet! Love that you added lemon too, it always helps to cut the sweetness! Yes, sth I like a lot about this smoothie is, that it’s not too sour and not too sweet! Blueberry smoothies are a classic! 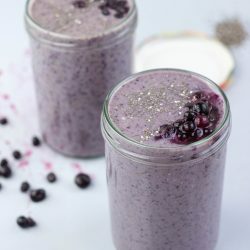 Blueberries are my favorite fruit for smoothies! 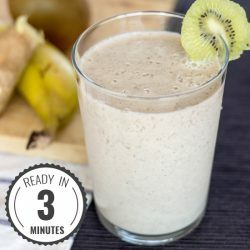 Such a beautiful smoothie, I love the ingredients combination, although that cottage cheese got me with a little question mark in my head… Anyway, good luck with it on competition! Blueberry, banana and 5 minutes?! Sold! Get in my blender then my belly! The color alone has me smitten! Yes, that really could work, Mel! Give this one a try, one of my favourites for sure!! Smoothies are my families go to breakfast. I love that they are so portable too! Blueberries are some of my favorite fruits. I love them in smoothies. G reat smoothie! Here’s one I invented that I just love. Feel free to use it! dash vanilla, dash cinnamon, 4 ice cubes. Blend. Less than 200 calories. Ooh, sounds good! A caffeine boost is always nice :D. Thanks for sharing!